A sweeping and dramatic history of the last half century of conflict in the Middle East from an award-winning journalist who has covered the region for over forty years, The Great War for Civilisation unflinchingly chronicles the tragedy of the region from the Algerian Civil War to the Iranian Revolution; from the American hostage crisis in Beirut to the Iran-Iraq War; from the 1991 Gulf War to the American invasion of Iraq in 2003. 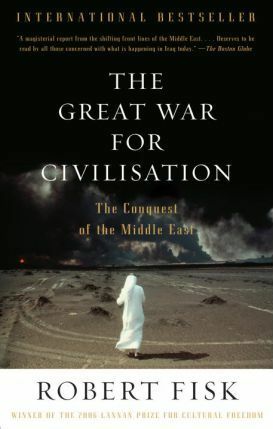 A book of searing drama as well as lucid, incisive analysis, The Great War for Civilisation is a work of major importance for today's world. Bestselling author and journalist Robert Fisk holds more British and international journalism awards than any other foreign correspondent. Fisk is currently the Middle East correspondent of The Independent, based in Beirut. He has lived in the Arab world for more than 40 years, covering Lebanon, five Israeli invasions, the Iran-Iraq war, the Soviet invasion of Afghanistan, the Algerian civil war, Saddam Hussein's invasion of Kuwait, the Bosnian and Kosovo wars, the American invasion and occupation of Iraq and the 2011 Arab revolutions. He has been awarded the British International Journalist of the Year Award seven times and has also received the Amnesty International UK Press Award twice. Robert Fisk received a Ph.D. in Political Science from Trinity College, Dublin and was The Times's (London) Belfast correspondent from 1971-1975 and its Middle East correspondent from 1976-1987. He is also the author of Pity the Nation, a history of the Lebanese war, and The Age of the Warrior, an anthology of his 'Comment' pieces from the Independent.